Each new J.W. Stannard wind chime is developed from an original concept based on the high standard of quality in both design and sound. Careful renderings are created for a realistic preview of the concept. 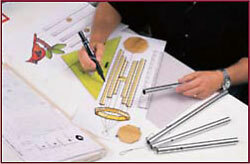 Upon completion of the drawings, materials are selected to uniquely enhance the spirit of the design. Determinations of wood type, bell diameter, clapper and paddle material and cord thickness are made. The beautiful musical sounds emanating through these high quality wind chimes are created by following specific and careful composition guidelines. 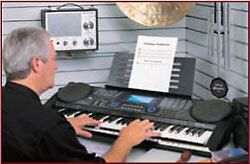 Each composition is developed and studied for harmonic compatibility. The individual notes and the entire scale are played on a keyboard both in sequence and at random to check overall sound relationshipos. After the final notes are determined, each bell is individually cut to size and hand-tuned to the appropriate note. The hand-tuned bells are then assembled in the best sounding and most aesthetically pleasing configuration. Here the cord length is calculated so the clapper will strike each bell at the precise location to produce the optimal sound. The sound dynamics are studied, adjusted and approved. Tests are performed on the bell spacing to achieve a beautiful and soft wind-driven melody. After the prototype has been approved, production samples are built and final specifications are created. 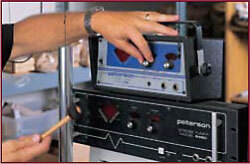 During production, each and every bell utilized is individually tested for sonic accuracy. As a result, every bell on every chime produced is individually hand-tuned for musical perfection. To document this musical achievement, the selected notes played by the chime are laser-etched onto the paddle. Each J.W. Stannard wind chime has its own unique specifications. 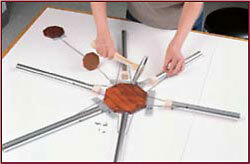 As a result, each design has its own unique Production Board created to ensure accurate bell and clapper placement. The J.W. Stannard patented on/off magnetic clapper is applied to the inside center of the top of the chime. This feature is available on most of the JWS designs. 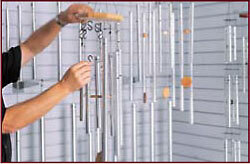 Upon completion, the wind chimes are inspected for uniformity and high quality before packaging.